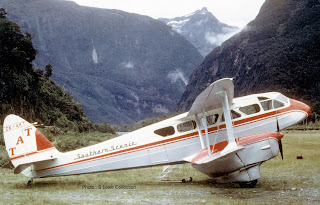 Queenstown based Southern Scenic Air Services, originally known as Southern Scenic Air Trips, was formed by F.J. (Popeye) Lucas, W. (Bill) Hewett, and Barry Topliss on the 9th of September 1947. The company started operations with an Auster J/1 Autocrat, ZK-APO, contributed by Lucas, and a Percival Proctor I, ZK-AJY, contributed by Hewett with the first official flight being made on 8 September 1947, freighting out whitebait from Jackson Bay and Big Bay in South Westland in the Auster. From an early stage the company wanted to operate regular air services. 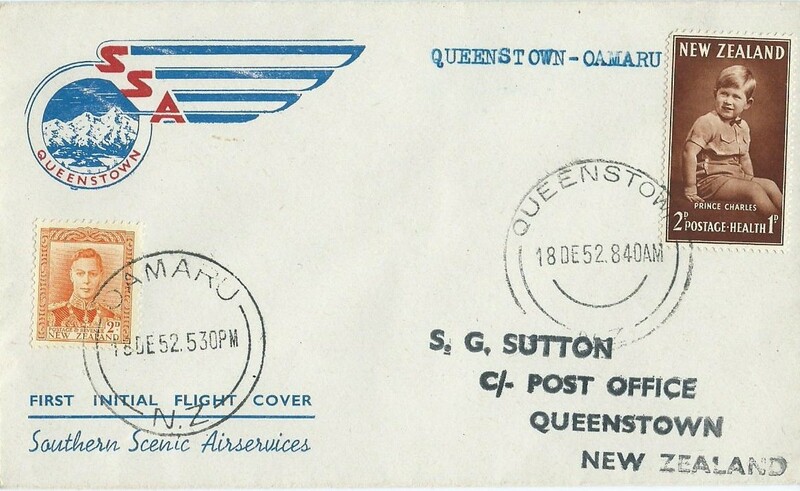 Throughout 1949 and into mid 1950 Southern Scenic Air Services sought approval to operate a Queenstown-Dunedin-Queenstown service, which would include both Cromwell and Alexandra, though the airfields at both these locations needed some work to bring them up to the required standard. NZNAC did some survey flights from Taieri to Alexandra, and on the 12th of December 1949 carried their first passengers to Central Otago, but later announced that the service would be restricted to air charter. 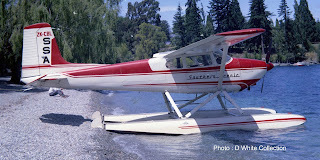 This did not meet with public approval and subsequently Southern Scenic Air Services were given the licence. 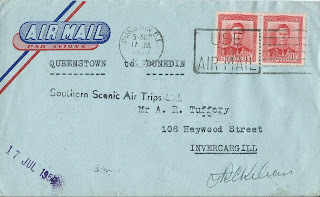 Southern Scenic’s Queenstown-Dunedin service began on 17th of July 1950, the first flight being flown by John Kilian. Initially the service operated twice weekly, calling at Cromwell at Alexandra as required and using Taieri airfield as the Dunedin terminus. Over the years the service was extended to a daily service with the timetable arranged to connect with the first NAC northbound flight, and to return to Queenstown after the last southbound one. The company later sought to extend the service northwards from Dunedin to Oamaru, Timaru, Ashburton and Christchurch. Approval, however, was only given to operate between Taieri and Oamaru. The company began operating this service on the 18th of December 1952. Lack of patronage later led to end the Oamaru service on the 30th of June 1953. In the early years the air service was operated by Austers and Proctors but from December 1953 Avro Anson XII, ZK-AXY, was introduced to the run. In 1956 the Anson was replaced by De Havilland DH89 Dominies which were much cheaper to run than the Anson. In August 1951 the company landed an Auster on a beach at Milford Sound paving the way for future flights to this scenic gem. Eventually an airstrip was built enabling regular flights from Queenstown with Austers, Proctors and later Cessnas. 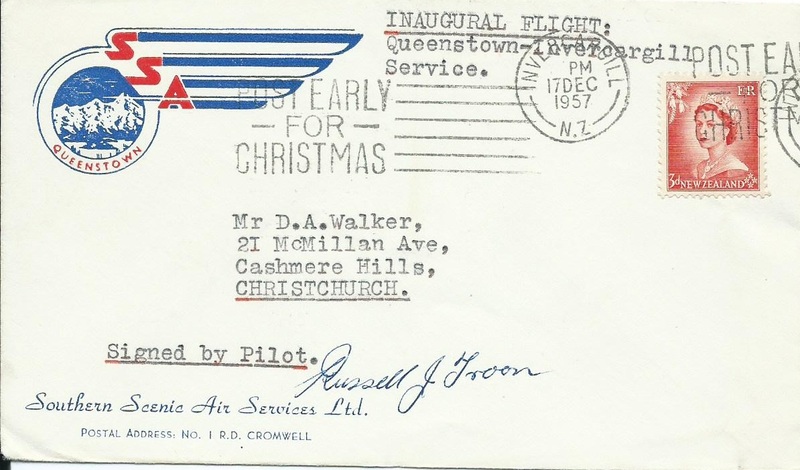 In 1956 the airstrip was upgraded to handle Dominies, with the Queenstown to Milford Sound flights becoming the heart of the company’s tourist flying. 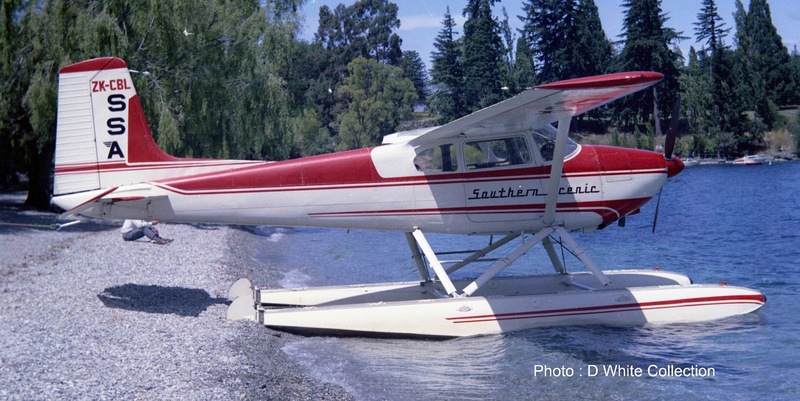 In the mid-1950s Southern Scenic established a subsidiary company, West Coast Airways Ltd, to take over and operate the NAC South Westland service from Hokitika. West Coast Airways commenced operations on the 19th of November 1956 serving Haast, Fox Glacier and Franz Josef and with a feeder service between Hokitika and Greymouth. 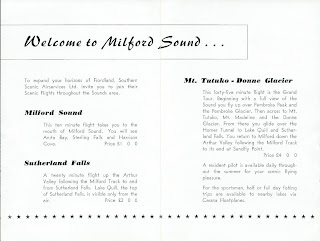 The company hoped to extend this service from Haast to Milford Sound to connect with their own flights from Milford to Queenstown and on through to Dunedin. While there may have been great tourist potential with this connection the West Coast Airways service to Milford Sound, which operated weekly, was never popular. Southern Scenic Air Services' Cessna 180 ZK-CBL at Queenstown. 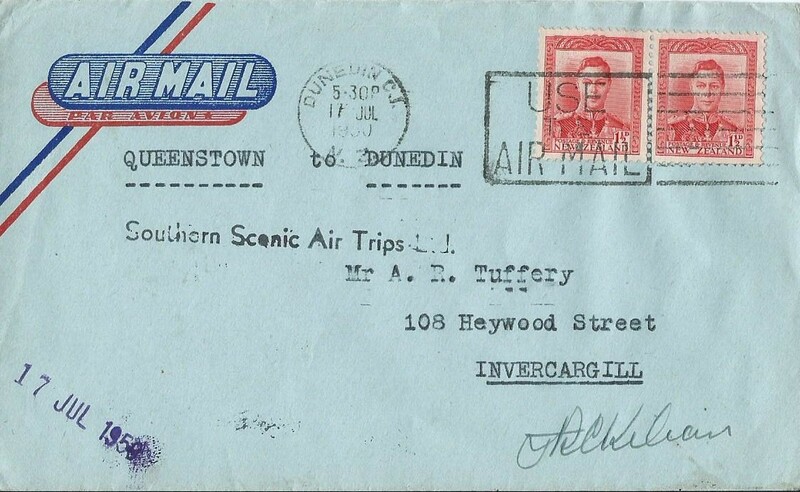 During the summer of 1957-58 the company trialled a six-day a week air service between Queenstown and Invercargill. The service commenced on the 17th of December 1957 with the first flight being piloted by Russell Troon. The Invercargill service, however, did not generate much traffic and ended at the end of the summer. Meanwhile, the Queenstown-Dunedin service continued to be a loss maker. However, as Popeye Lucas wrote, it produced intangible benefits: it rounded off our activities, gave us control of our area provided a vital service to the community, and put us on the map for incoming visitors. Some of the losses for the year could fairly have been considered advertising because of the goodwill generated and the indirect advertising we received, of which we were much in need, having no advertising formally budgeted in our annual estimates. I felt the good it did outweighed the loss. Having struggled so hard to get it going and having persevered when the loadings were low, I felt it was worthwhile hanging on now, as the tourist influx was increasing annually and in a few more years there would be a far greater volume of traffic. If it did nothing else it kept the aircraft fully utilised, which was most important. In April 1962, after Popeye had left the company, the Queenstown-Dunedin service was cut. By then Alexandra was being serviced by SPANZ which will be the next instalment. 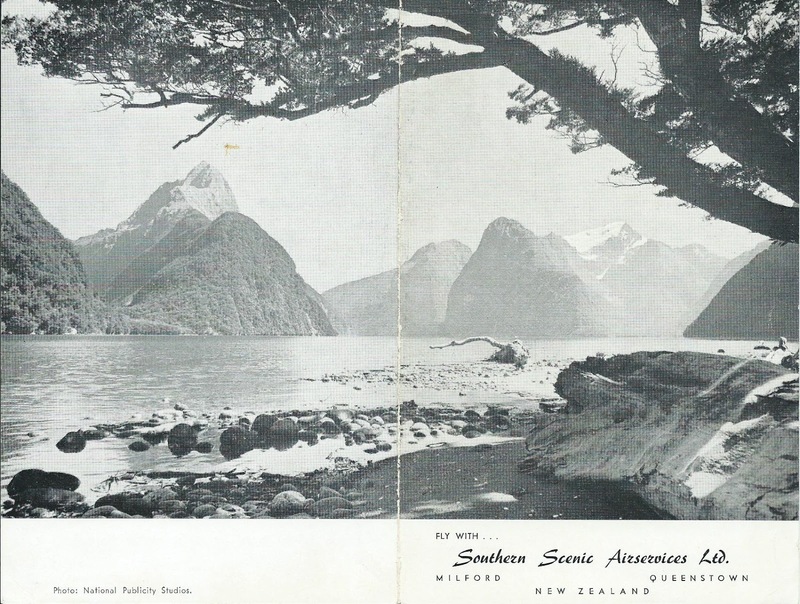 In May 1965 Southern Scenic Air Services Limited merged with Tourist Air Travel Limited which was subsequently bought by the Mount Cook and Southern Lakes Tourist Company which became more commonly known as Mount Cook Airlines. 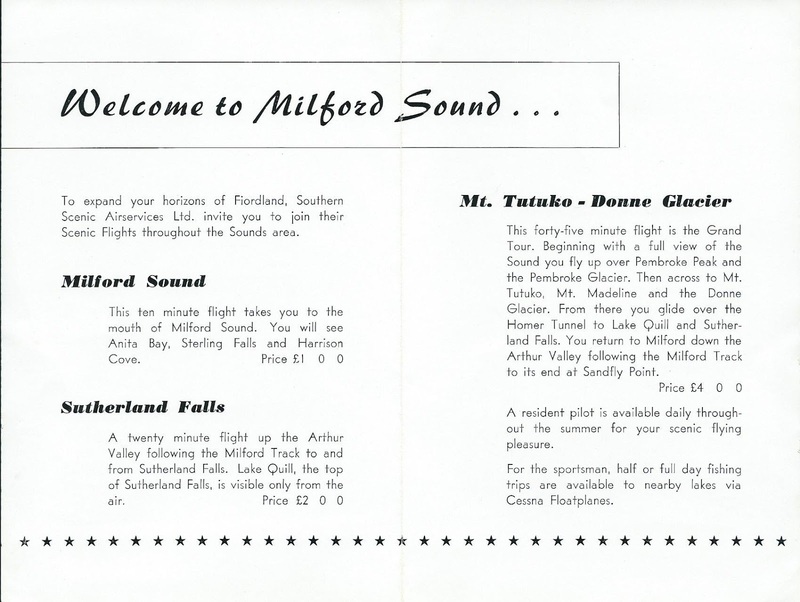 The Queenstown flightseeing operation was sold and became known as Milford Sound Flightseeing. Around 2002, a joint venture between The Helicopter Line and Real Journeys Limited was formed, the most recent name change was to, when Real Journeys bought 100% ownership, and the Real Journeys brand was added to the fleet. Ian Andrew Ritchie 1921-2010 R.I.P. What does the Pacific Blue withdrawal mean??? Is Eagle Jinxed at Blenheim??? PPQ TWR - Who Pays?